A blog irregularly updated by Nathan Schneider with essays, thoughts, and resources. The primary topics are veganism and the abolition of nonhuman exploitation. At this point in history, ‘animal advocacy’ typically involves vegetarianism and the regulation of atrocities. So, unfortunately, this project is irregular in at least two senses. Pages about the history of veganism and the history of vegetarianism. 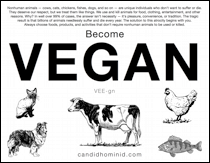 Others review how ‘vegan’ is used by dictionaries, the news media, and animal advocates.